Mercedes-Benz has unveiled its latest performance-orientated small saloon, the fiery AMG CLA 35. 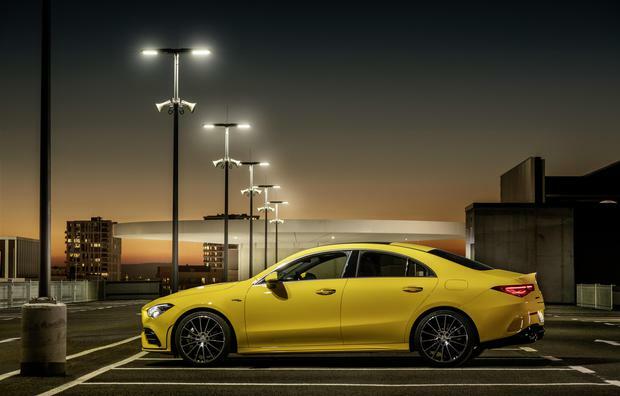 The compact sedan, which in design has a coupe-like appearance, is the latest in a string of entry-level AMG-badged ‘hot’ models. 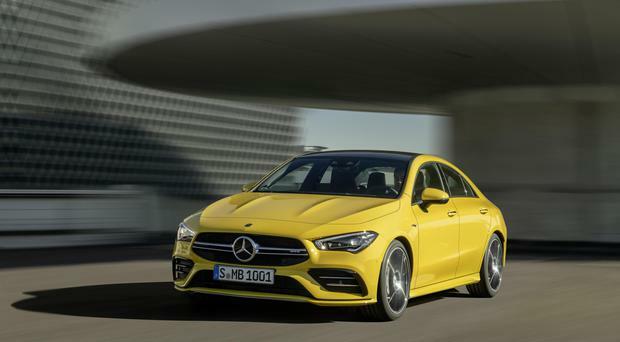 It’s the performance version of the CLA class of cars, a small front-wheel drive executive saloon positioned just below the C-Class in the Mercedes range (but above the smaller A-Class). 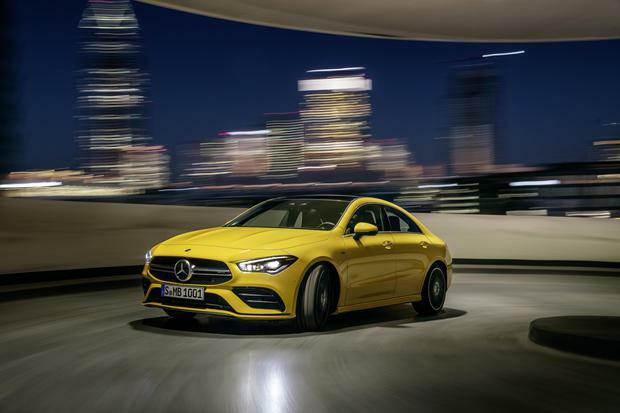 The AMG CLA 35 is designed to take on ‘hot’ rivals like the VW Golf R and Honda Civic R, both of which are known for their sporty prowess, although the Merc is significantly pricier. 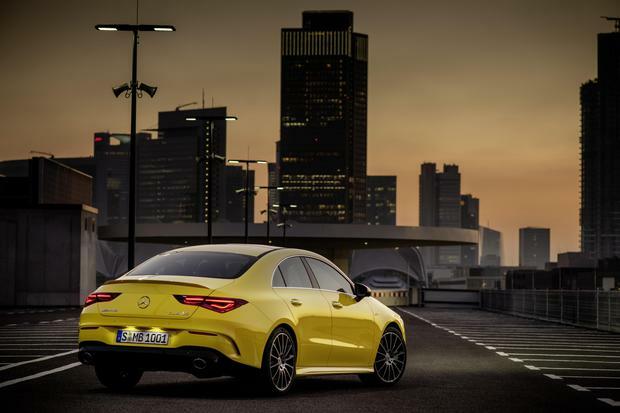 It’s closely related to the AMG A 35, which is a hatchback design based on Merc A-Class models. Like the A 35, the CLA 35 uses a turbocharged 2.0-litre petrol engine, but as a four-door coupe its design is sleeker and more sophisticated. A high torque 2.0-litre four-cylinder turbo engine (also seen in the AMG A 35 hatch) delivers 225 kW (306 hp), distributed to all four wheels via 7-speed dual-clutch transmission and all-wheel drive. The sporty performance (acceleration from 0-62 mph in 4.9 seconds) is linked with a wide spread of the driving experience - from very sporty to comfortable on long journeys. The exterior and interior have been reworked and appear aimed at a younger customer. 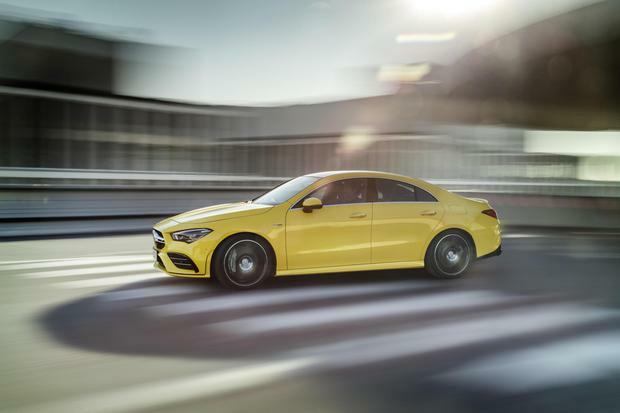 Mercedes-AMG boss Tobias Moers said: “With its iconic design and agile driving dynamics, the new CLA 35 is an attractive offer for a young, active and lifestyle-conscious target group. “These customers define their requirements very clearly: they expect exciting design from their vehicle alongside superior performance and inspiring handling characteristics. Exterior enhancements over and above the standard CLA models include better disc brakes, 18-inch twin-spoke alloy wheels, AMG Line bumpers. There’s also a rear spoiler lip, and a sportier rear diffuser, amongst other refinements. Inside the cabin, there’s a host of the latest Merc tech and goodies including voice activation, an MBUX infotainment system that spans the dashboard, a 360-degree external camera and leather-trimmed sports seats. A new feature is crank case made of high-strength, lightweight die-cast aluminium which reduces the vehicle weight where it matters most for driving dynamics. A twin-scroll turbocharger is used for turbocharging. It combines optimum responsiveness at low engine speeds with a strong power increase at higher speeds. Mercedes has explained that the housing of the twin-scroll turbocharger is divided into two parallel ducts. Together with two separate exhaust ducts in the exhaust manifold, this channels the exhaust gases separately on the turbine wheel, resulting in a further advantage of twin-scroll technology - minimisation of the mutually adverse effects of the individual cylinders on the gas cycle. Mercedes is also proclaiming a host of other improvements, including energy-saving measures like CAMTRONIC variable valve control, intelligent thermal management for engine and oil, high-precision piezo injectors and multi-spark ignition. The car will go on sale here in August, but will get its official launch at the New York auto show next week, with sales bookings starting on 29 April. We’d expect a £3k or £4k premium over the top-spec standard CLA model, meaning prices are likely to be in or around the £37k mark. Official pricing and UK/Ireland is expected within weeks of launch.